She was like a flame. What can we say about her life? We know so little. Though she was a close friend, I never questioned her about it. 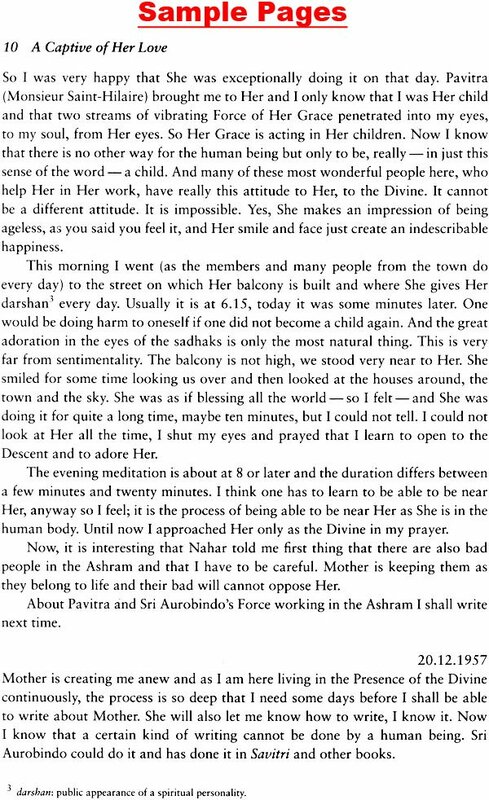 For she had come to the Ashram to practice the integral yoga of Sri Aurobindo, leaving the past behind her to be reborn to a new life. It was only incidentally that she spoke about herself and related some episodes of her life-story. From her papers we know that she was born in Lvov, Poland, on the 18th of July 1909. Her father, Jan Stroka, was an engineer, her mother, Jadwiga Krasuska, a teacher. Janina was the younger of their two daughters. After her secondary school examination in Zakopane, she entered the University of Cracow and in 1933 received her M.A. degree in pedagogy and psychology. During the six following years she worked as a teacher in a teachers' training college. In 1939, when the Nazis invaded Poland, the intelligentsia was advised to leave the country as there was fear of genocide. Janina was among those who joined the exodus. She started her journey with a group of thirty or more people, travelling by all available means, taking lifts in bullock carts or going on foot. Later, they had to disband and take shelter in farms on the way and, as the days passed, her group grew smaller and smaller, many dropping out through sheer exhaustion. When they drew near the Slovakia border in the Tatry, Janina found herself with only one companion who suddenly collapsed while they were climbing a mountain. It was a crucial moment, for any delay would defeat all their efforts. 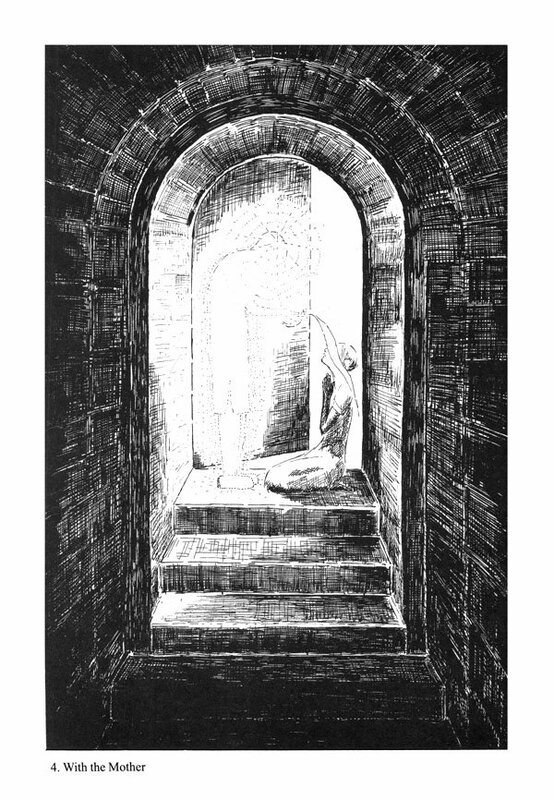 He entreated her to leave him to his fate and not lose her last chance of reaching safety. He preferred to die in his motherland under the wide sky - this was his freedom - his body one with the earth of Poland. Soon she was on the other side - alone. From Slovakia she went to Hungary and then, via Yugoslavia and Turkey, to Palestine - or rather what was then Palestine - along with other Polish refugees. This was in January 1941. Neither the itinerary by land and sea nor the details of the journey are known to us. The refugees were given shelter in a camp near Jerusalem. But there came a day when Janina could no longer bear the promiscuity of camp life and she left the settlement in search of work. She knocked at many doors, but they were all closed to her. She went on inquiring here and there and finally arrived at Ram Allah, where she presented herself at a boarding school for Arab girls. The headmistress was a Dutch lady who had been posted there by a Quaker association. She felt very sorry for Janina, whose qualifications were irrelevant here. "Do you know how to cook? how to sew?" she asked. There was nothing that Janina could do which would justify her employment. Yet, not having the heart to send her away, the headmistress welcomed her into the house. "We shall find something", she said. Janina found not only a refuge but also a friend, and more, a kindred soul. It is to this friend that most of the letters published here are addressed. Before Janina's arrival in that boarding school there was no real infirmary there, only a sick-room which often remained vacant. The nursing was confined to taking temperatures, giving medicine and food, and sending the boarders to a hospital if their condition was serious. Though there was no need of a special attendant, Janina was appointed to this task. Later on, she helped in teaching and gardening and assisted the headmistress in solving the problems of the Arab girl students. As time passed in that foreign land, the friendship between the two deepened. 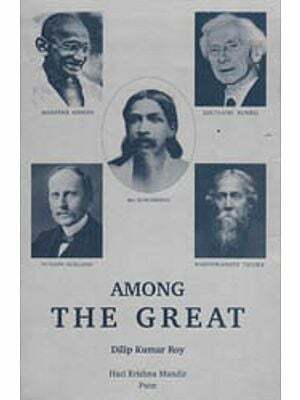 Once, in Jerusalem, a lecture on Sri Aurobindo was delivered by a German clergyman who later became a close friend of theirs. He used to give regular talks on the world's sages and mystics. In a way, he too was a refugee. Before Hitler came to power, he had seen in him a dark force and had written some articles in which he warned people about the coming danger. His political activities led to his arrest and imprisonment. The church negotiated his freedom but expelled him and he had to go into exile. This was for him the occasion to realise one of his old dreams: to go to the Orient, study Arabic and learn more about Islam. So it was that he found himself in Palestine when the war broke out. 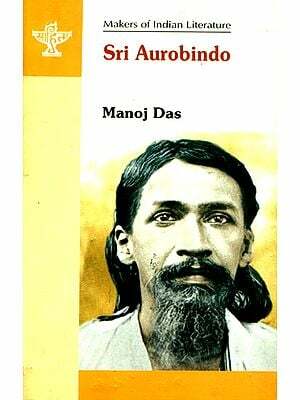 One day, as he was ferreting in a secondhand bookshop in Jerusalem, he discovered Sri Aurobindo's Life Divine. This came to him as a revelation and a message of hope. 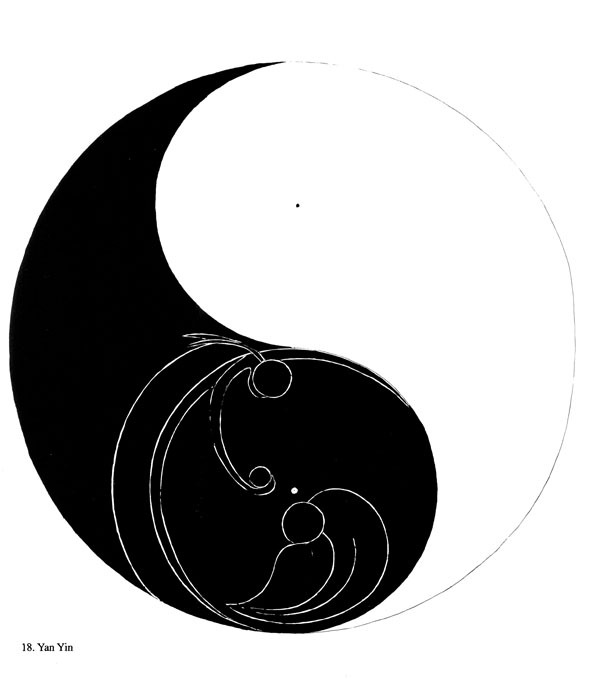 Evert if the dark forces were at present holding the world in their grip, there was Someone on earth whose spiritual force could change the course of events, transform the Shadow into Light and sow the seeds of a new world. 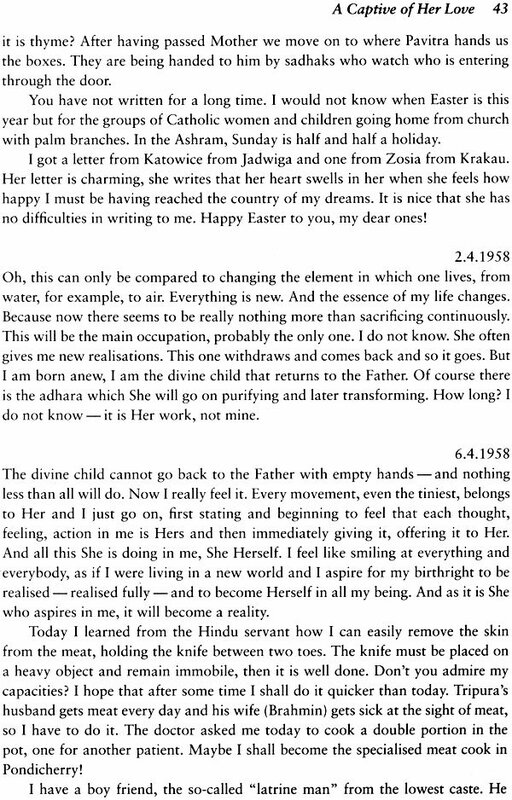 Janina heard the message of Sri Aurobindo and it was for her the beginning of a new life. More books by Sri Aurobindo and the Mother were obtained and she began to practice yoga with her friend. It was also at that time that she started painting. She had learned drawing and painting at school in Poland, but had never developed her talent, or only as much as was necessary for her teaching. Here, in Palestine, she began to paint water-colour landscapes. Work in the boarding school for Arab girls came to a stop at the end of the British Mandate in Palestine. As Janina was not a Jew, there was no reason for her to stay there and she decided to go back to Poland in February 1948. She worked there for nearly nine years, supervising the educational work of different institutions. Later on, she was put in charge of a home and school for mentally deficient children. Throughout this period, she continued to study the works of Sri Aurobindo and practice yoga, but she fell ill in the destructive atmosphere of soviet communism. In November 1956, thanks to a change of government in Poland, she obtained a passport for Germany where her friend now lived. There she was welcomed once more and nursed both in body and soul. It was in some way an apprenticeship of freedom, a kind of re-education. Janina had to learn to breathe and move and think as a free being in a free country. Living in a different atmosphere, she started to realise how much her soul had been stifled, her spirit wounded by the life in Poland under the communist regime. She could not possibly go back. 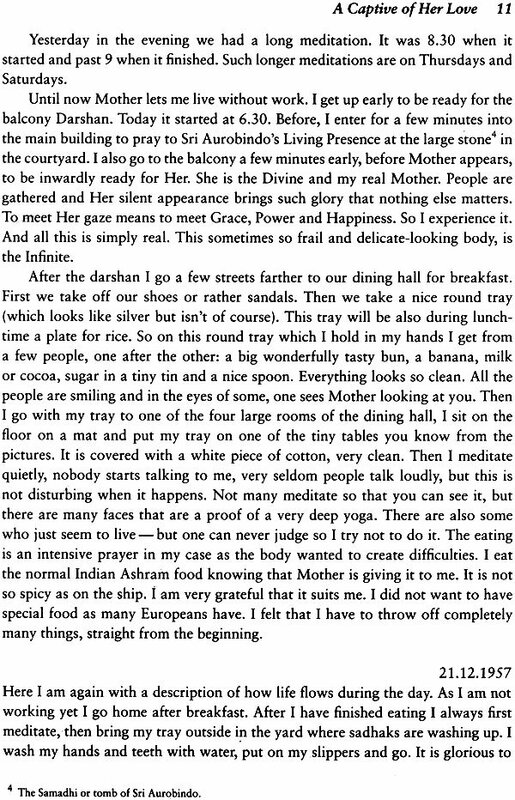 It was then that she made her decisive choice and with the consent of the Mother embarked for India, arriving in Pondicherry on the 17th of December 1957. 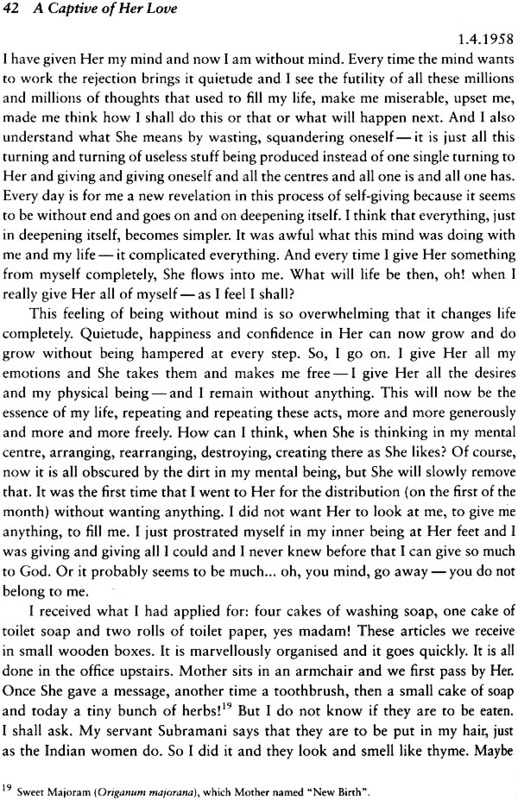 About her life in the Ashram, her letters to her friend reveal more than any- thing we can say. The Mother put her in charge of a nursing home for surgical cases. As she was not a trained nurse, the technical side of nursing was generally performed by others, but she kept the house spotlessly clean and managed, often out of next to nothing, to create an atmosphere of harmony and beauty. During her free time, she devoted herself to painting, drawing her inspiration from the works of Sri Aurobindo and the Mother. The colours she chose were always symbolic of a state or a plane of consciousness. She often used the technique of stippling: hundreds and hundreds of dots, into each of which went all her concentration; each dot contained the Divine Name. 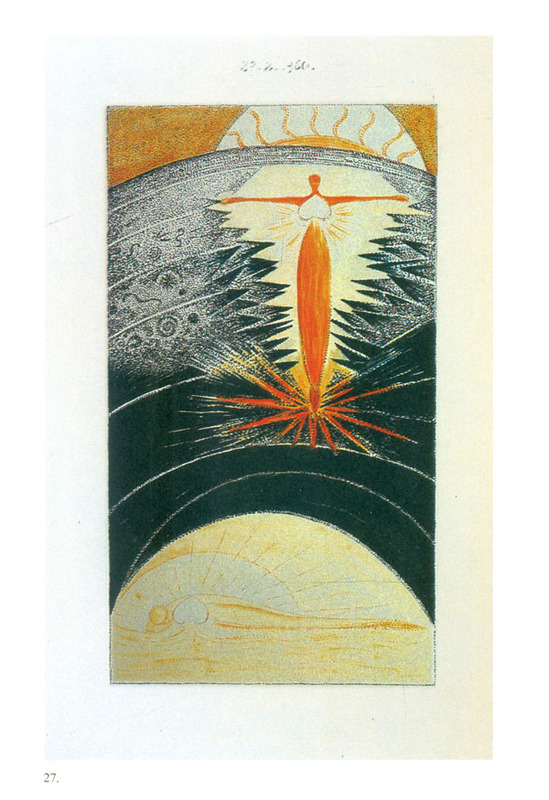 Later she painted several series of pictures to illustrate certain spiritual themes such as the adventure of the soul, the divine Play and the story of Creation. In her creative periods she could not stop painting, yet continued to take care of the patients with the same attention - the brush in one hand, the bedpan in the other, as she would say. In six and a half years, she produced more than three hundred paintings. From 1961, she started experiments with cement, taking the help of a master-mason to inlay this raw material with some fine worshipping figures. While thus experimenting, she dreamt of the future, of towns and houses whose walls would reflect the higher aspiration of man and his inner life. She also decorated pottery - plates, vases, lamps. 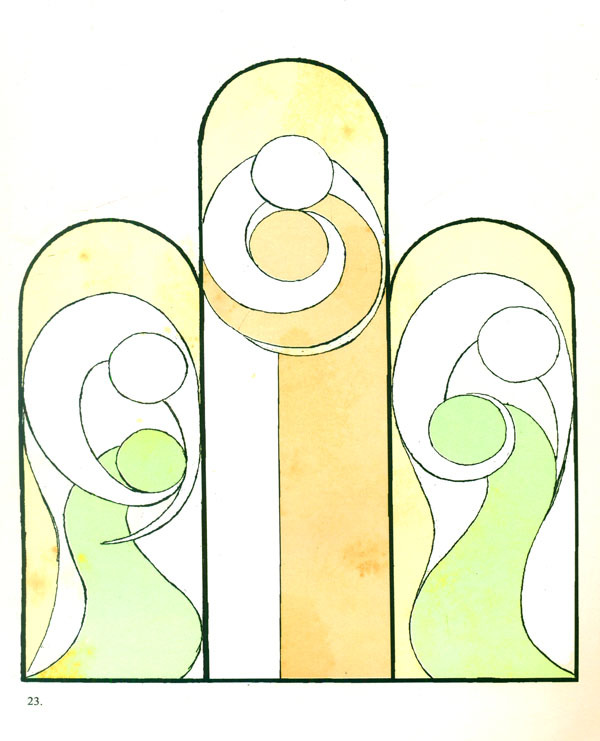 Her designs were not simply ornamental; each line and shade had a deep meaning. A spiral of tiny circles of different colours would suggest the evolution from the dark Inconscient to the orange-gold of the Supramental, the long journey of the soul through the red, green, blue and yellow of all the planes of existence and levels of consciousness - with, in the centre of each small circle, a golden dot, the divine spark, growing from a pinpoint in the dark inconscience and burning progressively through all the colours until it blazes forth into a golden sun. 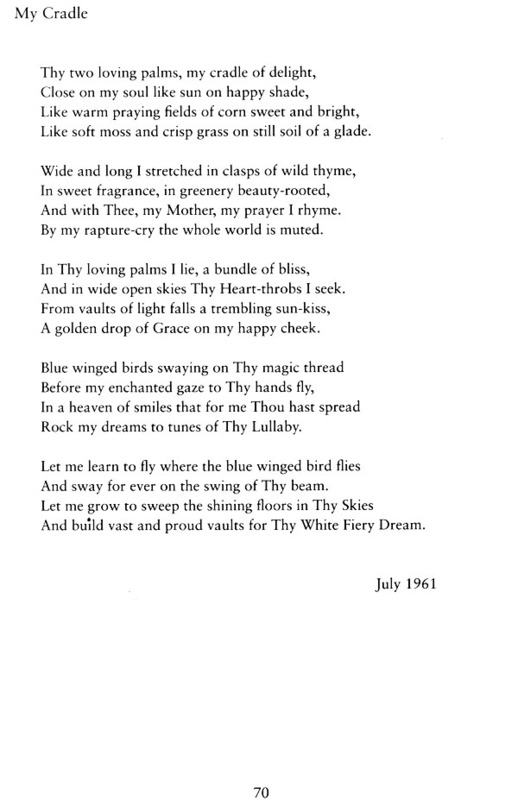 Her activities were not confined only to nursing and painting, she also helped some teachers of the Ashram school in their educational work and she wrote a number of poems in English and in French, a few of which we have included here. She lived in the consciousness of the One. For her, all was He, the Lord. This could be felt in her dealings with people, no matter who they were or what they did. Whether persons of rank or scavengers, she would always address them in the same considerate, even ceremonious manner. All happenings were to her manifestations of Him. Once there was a cyclone. 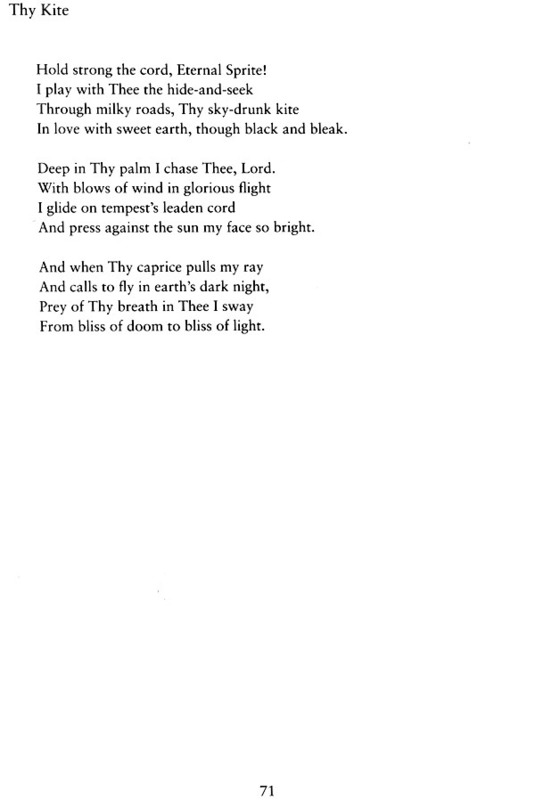 All night the tempest raged. One felt as if the world was being shaken to its foundations. Many trees were uprooted, roofs torn away. There was no electricity, no water supply, houses were leaking. The next morning, everybody's mind was full of the inconveniences of the situation. I met Janina and inquired about the damage to her nursing home and about how she had felt amidst the fury of the elements. Her face expressed nothing but glowing wonder and in amazement she said: "All this is happening in the body of the Lord!" I had read the Bhagavad-Gita many times, and meditated upon the chapter where Krishna reveals to Arjuna His cosmic form and appears as Time the Destroyer, swallowing all the worlds in His blazing mouth. All this I had tried to see in my mind and imagination, but that day, while our ears were still filled with the clamour of the storm, this simple remark of Janina's struck me with the force of a living truth - a truth that she had lived. At once I swung to another consciousness through the power of her experience. She had also a great sense of humour. About someone who had not been very nice to her, she said: "In one of my pictures, I shall paint him as a flower in the buttonhole of the Lord:"
This was her way of taking everything, good or bad, into herself and offering it to the Lord so that He might transform it. On July 17, 1964, the eve of her fifty-fifth birthday, as she was recovering from a fever, she suddenly died. Just prior to that, she had been working hard on a series of forty-eight pictures she wanted to offer to the Mother on that day. She had completed them all. 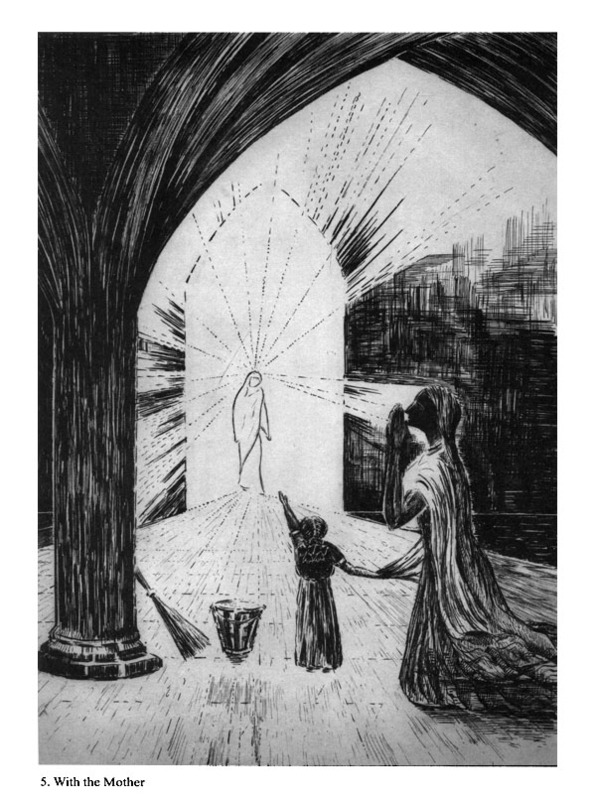 They illustrated her favorite theme: the journey of the soul out of the Mother's Heart, the plunge into the abyss and, through the divine alchemy in all the worlds, the Return and the Crown. She too was returning from her long journey. On the morning of the 18th, her birthday, at the time fixed by the Mother, her body was taken to the cremation ground, as is the custom here. As I was looking at the funeral pyre with a distressed heart, I saw the rising flames merge with the figures of her paintings. This indeed was her life; she was herself a flame of God's living Fire.